Background: MOOCs: For teaching or for profit? AFT 1493 is turning 50! EC members present: Eric Brenner, Chip Chandler, Vicki Clinton, Salumeh Eslamieh, Katharine Harer, Teeka James, Dan Kaplan (Exec. Secr. ), Michelle Kern, Monica Malamud, Sarah Powers, Sandi Raeber-Dorsett, Joaquin Rivera, Anne Stafford, Masao Suzuki, Rebecca Webb. Approved with some modificaions; two abstentions. – TMC (Transfer Model Curriculum) involves updating courses in a discipline, in order to get CID for those courses, even if that discipline is not proposing to follow TMC. – SLOs: We are expected to use TracDac. This requires faculty to get trained in TracDac (Part I of the TracDac is 77 pages long). Masao believes that the push to use SLOs and their assessments originated as a way to measure students’ learning in a more “absolute” manner, as compared to the “relative” method of grading on a curve. – Program Review/Program Plan: Although Program Review can be a very useful process of reflection and planning, if we must do a Program Plan every year then there is no time for reflection or even planning—just cranking out a report. Also, the annual process is not very different from the Comprehensive Program Review that we perform every six years, which means that faculty must invest huge amounts of time every year now doing something that we used to do only once in six years in the past. – CurricUNET: another tool that faculty are expected to use, both for currilum as well as for Program Review/Program Planning. Masao said that these issues are related to our contract, because they greatly affect workload. “Shared” Governance is now being called “Participatory” Governance. There is a rumor that faculty may be docked pay for not attending division meetings. “(A) SLO’s are bogging professors down and taking their time away from ‘teaching’; isn’t that why we’re here? This is a major Union issue because I believe are work load now goes way byond contract. Serving on a committee AND doing the extra work of 2-3 committees in SLOS work is beyond what we’re being paid for. (C) Free speech is being denied on campus. In the division meeting you [Nina] attended you witnessed the explusion of a professor for divulging his views. Later in that meeting, we were told that we would complete the document described in item B above, and there would be no discussion about it. If we can[not] use a division meeting for ‘shared governance’, where can we exercise it? Teeka reported that at CSM, they are doing Program Plan Review on an annual basis. Monica said that the same has been happening at Cañada for a few years now. George Wright said that he is in agreement with Masao’s and George Buckingham’ s views. At a recent division meeting, the dean tried to kick George W. out of the meeting. He refused to leave. Eighteen days after this incident, he received an email from the dean requesting a meeting to discuss his behavior. Monica mentioned that instead of starting our own movement, we can join other organizations which are already working on these issues. For example, AFT Higher Ed is already discussing privatization and corporization of public education, and at the CFT Convention last weekend there were suggestions regarding accreditation and the role of ACCJC. ⇒ George’s proposed resolution will be re-worked and brought back to a future AFT meeting. We also discussed the issue of evaluations of administrators. Board policy language is not forceful enough, in that it only says that administrators’ evaluations may include evaluations by those supervised. At CSM, faculty participate in the evaluation of their deans, at Skyline only selected faculty are invited to participate, and at Cañada faculty do not participate in the process at all. ⇒ The EC will communicate with Harry Joel about this disparity among the campuses, and request that all faculty be allowed to participate in the evaluation of administrators. and Nancy Wolford. They each will get a $50 credit card. Teeka shared some of the survey results; she showed tallied results for faculty as a whole, and broken down by groups (for example, part-time/full-time, or classroom faculty/counselors/others). ⇒ Teeka, Joaquin and Monica will work on analyzing the survey results. The EC discussed the challenges that the PETF is facing as it tries to make progress in the revision of faculty evaluation procedures. Teeka will communicate with Diana Bennett, District Academic Senate President, to share the concerns expressed at this meeting. a) Teeka reported on CFT Convention last weekend. Our local was recognized on its 50th anniversary. We also won four communications awards: 3rd place for website, 2nd place on use of graphic, 3rd place for electronic version of the Advocate, 3rd place for best single effort. b) Joaquin is working on Calendar Survey. c) Joaquin and Teeka finalized negotiations on Policies with the District. On Wednesday April 24, the District Academic Senate hosted a discussion for district faculty on issues related to the possible offering of MOOCs (massive open online courses) in SMCCCD. About 12 – 15 faculty members attended the meeting, including Diana Bennett, District Academic Senate President, Tania Beliz, District Distance Education Advisory Committee (DEAC) Co-Chair, Peter Bruni, Vice Chancellor, Educational Services and Planning and James Carranza, CSM Academic Senate President. The Board of Trustees has recommended that the District initiate some kind of pilot MOOC program, under the direction of faculty, but the specifics of such a pilot program are still unclear. The District has not contracted with any MOOC company, however discussions have taken place with Udacity, one of the leading MOOC producers. Tania and Diana reported that they visited Udacity and were told that MOOCs was a “faculty owned process” and that they want to do away with any textbook. Faculty at the meeting raised concerns about how could the “massive” number of students—especially typical community college students–be taught effectively. MOOCs are primarily content delivery mechanisms but community colleges provide instruction. Why do students need them? Are MOOCs the best fit for community college students? What demonstrated need is there for MOOCS in our District? Which students are best served by them? How do MOOCs improve the quality of instruction, improve student success or access? What will a compensation model be for faculty who “teach” a MOOC? How could MOOC classes meet Title V and distance education regulations including “effective contact” and would the ACCJC grant accreditation to such classes? What are the commercial and financial aspects of MOOCs? What are other community colleges doing with MOOCs? Ed. Note: This report was based on notes from the meeting taken by James Carranza and Dan Kaplan. MOOCs: For teaching or for profit? Although the first MOOCs- and the term itself, “massive, open-source, online course”- was originated in Canada in 2008, the world essentially took notice of this latest version of distance learning in 2012, when the press carried reports of how Sebastian Thrun, a Stanford professor of robotics and Peter Norvig, a Google research director, offered in late 2011 a free online Stanford course in artificial intelligence for which an unbelievable 160,000 students from 190 countries enrolled. Two Stanford professors of computer science, Andrew Ng and Daphne Koller, had an equally spectacular result when then enrolled 104,000 students in their first MOOC. Although the vast majority of enrollees never completed these courses, Dr. Thrun wasted no time in founding Udacity, a for-profit enterprise, to partner with colleges to establish such online platforms, and Drs. Ng. and Koller promptly established Coursera for similar entrepreneurial ends. The unique features of these MOOCs originally included free online-delivered lectures, plus course materials and exams with immediate correction by automated assessment technology. Courses featured well-known professors at elite institutions like Harvard, MIT, Stanford, Princeton, and the universities of Pennsylvania and Michigan and were open to anyone who wanted to enroll. Those who successfully completed the courses (approximately 10 percent according to Thrun and only 7 percent according to Coursera) would receive a certificate of completion, but no academic credit at the awarding institution. With these instructional elements, accompanied by the “massive” global scope and enthusiastic response, plus the “free” element and the prestige of elite schools which offered MOOCs, some enthusiasts began to consider them the next big thing on the educational horizon. Thomas Friedman, the New York Times columnist who is a faithful promoter of technological fixes for many of the world’s complicated problems, contributed to the MOOC hype in the media when he wrote enthusiastically about a “revolution in the universities” which would occur if online learning were more widely implemented. The world’s financial and corporate elite, in its turn, was briefed Jan. 2013 at the World Economic Forum in Davos, Switzerland, about the implications of MOOCs. Coinciding with these developments was the crisis in California’s public institutions of higher learning, brought on by budgetary constraints, an expanding student population, and reduced course and program offerings, accompanied by cuts in faculty and staff. By the 2011-12 academic year, community colleges had suffered a 20% reduction in course offerings since 2008, reflected in the dilemma of a half-million students who were unable to enroll. Faced with this kind of situation, Governor Brown declared that increased recourse to online course delivery (114,000 community college students were already enrolled in online courses in 2011-12) was “inevitable” at all levels of public higher education. He included in his Jan. 2013 budget proposal $16.9 million for community colleges to expand options for students who are presently unable to enroll in hundreds of impacted, high-demand, prerequisite courses. This is where MOOCs come in, but it is in a form different in some respects from those originally offered (described above.) Their altered nature is best reflected in Senate Bill 520, introduced into the California state Senate by the Democrat President Pro Tem Steinberg earlier this spring. Although SB 520 is presently subject to a number of amendments, they essentially will not eliminate the privatizing, outsourcing, and pedagogically undesirable dehumanizing characteristics of MOOCs. If this or similar legislation were to pass, the University of California, CSU institutions, and community colleges would be required to offer credit for online courses produced by for-profit firms like Udacity, Coursera, or EdX and selected from a state-wide predetermined list of 50 enrollment-impacted, lower-level courses. They would not involve the massive open enrollment characteristic of some MOOCs, but the name has obviously been retained to evoke the appeal of their original elite and global associations. Class lectures would consist of online videos of pre-recorded lectures by prestigious outside professors with whom private producers like Udacity and Coursera had contracted. These large-enrollment MOOC classes would replace some offerings staffed by in-house community college faculty; and public colleges would be legally obliged to accept for credit even MOOCs taken by students from third-party providers without the intermediary of a public institution. This legislation would thus represent the attainment of a crucial objective of all for-profit enterprises involved in online education (a “massive industry” according to a recent article in the Sacramento Bee): i.e., attainment of access to academic credit in degree-awarding public institutions for courses offered outside the existing academic framework. It would be a milestone on the way to privatization of a vast educational market in California and elsewhere. Not unexpectedly, the Academic Senate of the University of California signed an open letter denouncing SB 520 because it would place approval of these third party-developed MOOC courses in the hands of a special appointed panel unaccountable to the UC Senate’s existing review processes and bylaws. The arrangement, the letter said, would thereby allow corporate interests to replace faculty control over online curricula. Despite such misgivings and the ultimate legislative fate of SB520, San Jose State University, a CSU campus in the heart of Silicon Valley, has already independently signed a contract with Udacity for remedial math, college algebra, and elementary statistics courses. Expected summer enrollments are 200 for each of the first two and 1000 (!) for the last. Students will watch videos of class lectures and take a series of interactive quizzes. Despite such misgivings and realities, the powerful interests pushing for ever-increasing privatization and digitalization of public education at all levels, federal, state, and local, have substantial economic means and powerful political connections. They can only be expected to continue their efforts to transform education for their own economic benefit. It is worth noting in this regard that Udacity is backed by venture capitalist firm Andresson Horowitz; and Coursera is allied with Silicon Valley venture capitalist firm Kleiner Perkins Caulfield, and Byers. In any case, as the economic and educational realities of this latest innovation in distance learning become increasingly evident, it will become clearer whether MOOCs are ultimately a learning model or a business model. Since no one has answered the Advocate’s call for alternative viewpoints, I am going to assume that the magazine’s readers are convinced that MOOCs are a negative development and move on to the question of what we should do about them. I want to start by talking about what we shouldn’t do, and, to that end, I want to talk about déjà vu. I went to a District-Academic-Senate-organized faculty meeting on MOOCs on April 24th. Sixteen people were in attendance, including the facilitators: Diana Bennett, DAS president, and Tania Beliz, co-chair of the Distance Education Advisory. Not me. I was thrown back in time and landed in one of the first meetings that I attended as a newly full-time and untenured faculty member in the English department at Cañada College in Fall of 2004. The topic of that meeting (it was a meeting of the Executive Committee of AFT 1493, of which I was not a member at that time) was not MOOCs. It was student learning outcomes. SLOs. I understand where this comes from. Hanging back makes you look lazy. Recalcitrant. In the case of MOOCs, it might make you look like a Luddite. But the expectation that being in on the conversation amounts to having any power over the outcome is a false one. SLOs are a case in point. We have been “in on the conversation” from the very beginning, unless I am very much mistaken. And for a while now we have been told, with increasing stridency, mainly by administrators at various levels, that SLOs have to be on our syllabi, in our course outlines of record, on TracDat, in Curricunet, etc., etc. We were in on the conversation, but, as far as I know, we never voted for or agreed, as a faculty, to any of this. We were in on the conversation, but SLOs are now, like the broomstick in the hands of the sorcerer’s apprentice, completely out of our control. In addition to being a member of the Executive Committee of AFT 1493, I am also a member of the Performance Evaluation Task Force (PETF), the body appointed to rewrite the evaluation portion of the contract. The PETF voted in February 2013 to include SLO involvement in the self-assessment section of the evaluation. The faculty members of the Task Force were told by the administration members of the Task Force that we needed something about SLOs in our evaluation process or we were not going to get accredited. The vote was 5-1. From what I have heard, some people are pretty unhappy about this vote. I was the dissenting voice. I was in on the conversation, and my vote was noted, but it was purely symbolic; we are not organized to resist this pressure. Being in on the conversation means nothing. Only your activism guarantees your rights. Like MOOCs, SLOs were a “faculty-driven process” (at least, this is what I’ve been told; I’ve never actually met the faculty who cooked them up or seen them take credit anywhere). Like MOOCs, there is no proof whatsoever that they are good for teaching or, by extension, students. But some faculty think that they are important, and I am not trying to argue with them here. I did that at various meetings for a long time, starting with the first one in 2004. I argued, based on what was happening to the folks in pre-K-12 at the time, that SLOs are a precursor to standardization, which in turn is a precursor to privatization. I got tired of making that argument. Few people were particularly interested. If you are interested now, write me and maybe we can have coffee and talk about how miserably we lost that one. So now I am not making that argument. Because whatever you want to say about SLOs, we are now an SLO-driven faculty—whether that leads to any meaningful assessment of teaching techniques or not. What I am arguing now is that there is no safety in a faculty-driven process unless the faculty are organized to protect their interests. Only your activism guarantees your rights. What was happening to pre-K-12 in 2004 is happening even harder now. Rampant standardized testing, non-unionized, privatized charter schools that cherry pick students to raise test scores, and merit-based pay are becoming the new normal for them. Maybe they were in on the conversation and it was a faculty-driven process. In any case, some unions are now fighting back in a meaningful way, and I think we should look to them for answers in how to take on MOOCs. In 2012, the Chicago Teachers Union held a successful one-week strike and won many of their demands. Why were they so successful? Because they organized their community to support them. How did they do this? By asking students and parents what they thought needed to happen to improve Chicago schools. They produced a pamphlet, “The Schools Chicago’s Students Deserve: Research-based Proposals To Strengthen Elementary And Secondary Education In The Chicago Public Schools” (http://www.ctunet.com/blog/text/SCSD_Report-02-16-2012-1.pdf). What did the students and their parents want? Standardized testing? Merit-based pay? Non-union sites? No. Smaller class sizes. Less racism. More nurses. Teachers who were treated like professionals and whose decisions were respected. We keep getting told that “there is demand” for online courses (although not so much that there is actual demand for massive online courses). This may be true of students who had their sights set on the CSUs and are now blocked out of impacted departments because of budget cuts. But what about our student base? What do they want? The San Mateo Community College District is a community college district. What does our community want? We need to find out. This means bringing students into the discussion—something the MOOCs pointedly don’t do. Having this discussion will help us gather data about what our students actually want and will help us to organize around our common interests. Standardized testing now begins in kindergarten (check out “My kindergartener had 14 tests this year” from the Washington Post). Talk about a new normal. (For those of you who think that what has gone/is going on in pre-K-12 has nothing to do with us in higher education, stop it. Just stop it.) There are stories all over the news of kids cracking under the pressure, waking up screaming from dreams of bubbling errors. Educators from Finland, the most successful educational system in the world, know that standardized tests are a bad idea. They don’t have any. Most educators with any integrity know that the Finns are right. Only blatant, cheating opportunists like Michelle Rhee (who was caught cheating, again), think that they have anything to do with the quality of education. They are about controlling teachers and busting unions. So sometimes being right about the educational value of something is not enough. The teachers at Garfield High in Seattle know this. That’s why they decided to refuse to administer the (controversially acquired) MAP test to their students. It started with one teacher telling her union rep in the staff lunchroom why she personally would not do it and ended with a successful boycott. The district threatened them with a ten-day unpaid suspension for their refusal. The promotion of MOOCs is not about providing access. It is not about improving success—compare the 10 percent success rate of MOOCs to the 70 percent success rate required of us on TracDat. It is about privatization. It is about a business-model definition of efficiency. It is about doing “more” with less—“educating” more students with fewer instructors. It is about a small number of people cashing in on a market that they have been drooling over at least since the eighties when neoliberal vanguardists from the Chicago School were testing this stuff out in Pinochet’s Chile. If it weren’t, Sebastian Thrun would not have given up his tenured position at Stanford to run a MOOC. They are a threat to the quality of education afforded our students and a threat to our jobs. They are exactly the kind of thing that we, like the teachers at Garfield High, need to figure out how to stand against. This will mean organizing. That is, initially, those few of us who agree coming together, talking about our vision of what education should look like, and taking steps to make it happen/keep it happening. It will mean having disagreements, working through them, and moving forward. It will mean weathering being accused of being Luddites, old fashioned, etc. It will mean convincing people who are not currently convinced, who are afraid of appearing anti-technology, who are busy and stressed out because of the increasing demands that have been placed on us, that, yes, we have to do something more. It will mean doing this in the ones and twos, and, hopefully, eventually, in large rooms. It will mean developing a plan of action and carrying it through. AFT Local 1493’s Negotiating Committee (Chief Negotiator Joaquin Rivera, Monica Malamud and Part-Timer Reps. Victoria Clinton and Sandi Raeber-Dorsett) are currently negotiating with the District on salary and benefits for the 2013-14 academic year and the following two additional items: class assignments and flex days for part-time faculty. Negotiators are scheduled to meet again on May 10. AFT will send out a negotiations update by email if and when there is a settlement or any significant developments. The District Performance Evaluation Task Force (PETF) met twice in April, in part to deal with the for-accreditation, time-sensitive issues of Student Learning Outcomes (SLOs) and designing a pilot process for distance education evaluation, which is not a part of the current contract. In our April 8th meeting, we discussed the proposal (voted up 5 to 1 at the February 11th meeting) to include SLOs in the evaluation process through faculty self-assessment. Noting mixed faculty response to the idea, Task Force members discussed the importance of making it clear that people can be active in assessing SLOs in many ways, not just typing them into TracDat: through faculty-faculty dialogue, working in professional organizations, working with our institutional researchers, engaging in curriculum mapping as part of a retreat, using student input through ad hoc surveys, and through analysis of exams and resulting curricular changes. We also went through a series of documents provided by Professor Rachel Bell (Skyline English) and a group of other professors who have been working independently to informally assess distance education classes. These documents were very helpful as a starting point for creating the distance education section of the evaluation process. In our second meeting on April 22, we came up with a timeline for a pilot process of distance education evaluation for which we will be asking for volunteer evaluators and evaluees. The proposal is to run the pilot for a full year (from Fall 2013 to Spring 2014) and assess it through feedback from both evaluators and evaluees. We will be discussing with our institutional researcher what percentage of distance education classes would need to be pilot (i.e., mock) evaluated in order to have a rich sample. At our meeting in May, we will finalize plans for the project and devise a formal call for volunteers. If you already know you’re interested, please contact one of the Task Force members. Between meetings, Task Force members have been continuing to make the rounds of division meetings on all three campuses to have faculty fill in surveys, ask questions, and weigh in on their impressions of the existing evaluation process as well as proposed changes and additions. In addition, Task Force member Lezlee Ware has been soliciting feedback on the classroom observation form through email and receiving scads of useful information. Thanks again for your engagement in this process. You can access all PETF meeting minutes and surveys, as well as samples of evaluation processes from other colleges, on our Sharepoint site. Please also feel free to email me at terzakise@smccd.edu with any questions or comments. Board Policy 5.16 outlines the District’s policy for evaluating managers. Few people would be surprised by the stated purposes of management evaluation, among them “recognizing excellence “ and “identify[ing] areas of performance needing improvement.” All District managers and academic supervisors are evaluated annually by their supervisors and every three years undergo a comprehensive evaluation that includes multiple measures. What might surprise some is that one of those measures is an evaluation of the supervisor by the supervised, meaning that faculty and staff, in theory, have a voice in the evaluation of deans, directors, and vice presidents. Who knew? Well, CSM faculty and staff did. There, when deans and vice presidents undergo their comprehensive evaluations, everyone has a voice. For example, when a dean has his or her comprehensive review, all faculty and staff in the division are given survey forms which are to be filled out anonymously and returned to the vice president of instruction or student services, whichever is appropriate. The voice of the supervised seems to be used much as student evaluations are used for evaluating faculty—the supervised aren’t privy to the outcome, but we’re fairly confident our opinions are instructive. It may be the case that Cañada and Skyline Colleges have the same practice (as they should, since they are governed by the same board policies and procedures), but AFT chapter leaders there have not heard of faculty regularly participating in the evaluation of administrators. The proverbial loophole may be in the language of the board policy: “Within a three year period, each academic supervisor will undergo a comprehensive evaluation which may include self-assessment, evaluation by peers and others (including those supervised) and evaluation by the supervisor” (5.16.3; emphasis added). Since the voice of the supervised is not a compulsory component of the evaluation, perhaps college presidents and vice presidents choose to not bother with it. When the District Participatory (née Shared) Governance Council last reviewed this board policy, Vice Chancellor of Human Resources Harry Joel initially proposed striking “including those supervised” because, in his experience, that option was rarely exercised. But when AFT and others on the Council expressed concern that the supervised not be forever silenced in this arena, Harry Joel readily agreed. The Council agreed to the phrasing with “may” because some classified staff were concerned, and rightly so, that if evaluation by those being supervised were a compulsory component to the process, it would be difficult to preserve the anonymity of staff in smaller work units. A quick review of the literature reveals that at the end of the last century, when quite a lot of research in the field looked into “upward appraisal” and “360 feedback,” many studies indicated that subordinates evaluate their bosses’ management skills more accurately than peers and supervisors do, and a twenty-first century study by the Arizona Health Sciences Library concluded that “upward evaluation provides a continuing and evolving opportunity to improve the relationship between employees and their supervisors and as such to improve the morale and performance of all” (Howe). It seems that the District is following best practices in evaluation by providing a mechanism for the supervised to weigh in on their supervisors’ management skills. However, it would probably be a more effective system if all three colleges used it. Did you know that teachers are the most organized sector of the U.S. labor force? Not teamsters or longshoremen, but public school teachers and school support staff. This is according to Josh Pechthalt, President of the California Federation of Teachers, speaking at the CFT’s 71st Convention which was March 15 – 17 in Sacramento. That helps explain the victory of Prop 30 and the defeat of Prop 32 last November. However, Pechthalt made it clear in his State of the Union speech at the convention that teachers could not have accomplished this without a lot of help. The financial crisis of the last four years and the ensuing damage to schools and social services, coupled with the growing awareness that California’s tax system is badly broken, helped to forge strong bonds between teachers and communities. The 455 delegates and guests at the Convention got up off their folding chairs and applauded loudly for National AFT President, Randi Weingarten, when she declared: “We are battling an unholy alliance of millionaires whose fixation is on our evisceration.” Both she and Pechthalt hammered home the point that wealthy and corporate interests have a master plan for education in this country. They are pouring millions of dollars into local elections, from school board seats up to statewide offices, to get their candidates into power. Their agenda to privatize education uses the language of “reform” to close public schools and lay off teachers. Weingarten declared: “It takes investment to nurture and educate students.” As a country, we have been actively de-investing in our public schools. The AFT President cited hair-raising statistics: Corporate profits make up 14.2% of the national income, the largest share since 1950. The top 1% of the U.S. own 42% of the financial wealth. What about the bottom 60%? Our share is a paltry 2.3%. These disparities can be tracked with the decline of organized labor. California, once a shining example of education, has fallen to 49 of 52 states and territories in per pupil spending, while, ironically, our state ranks as the 8th largest economy in the world. AFT 1493 delegates to the CFT Convention (from left to right) Monica Malamud, Teeka James, Nina Floro, Dan Kaplan and Katharine Harer. Fact: the teachers’ retirement fund will run out of money by the mid 2040’s unless something changes. A Senate Concurrent Resolution (105) has established a framework for a funding plan, and CalSTRS has been directed to work with “stakeholders” to study various options. One option is to do nothing and hope the economy picks up so that investments will carry the fund. Another option is to increase rates of contribution for each of the three players: school districts, CalSTRS members and the state. These contributions haven’t changed for quite a long time: the last school district increase was 22 years ago and the last increase to teachers was 40 years ago. Furthermore, CalSTRS cannot change contribution rates on its own; it must be done through legislation. Alisa Messer, President of AFT Local 2121 (City College of San Francisco), spoke to the convention about the struggles City College faculty and students have undergone since their college landed in the crosshairs of the ACCJC. Messer spoke about the unnecessary and autocratic changes caused by the commission. She conceded that there were some issues that needed to be addressed to make CCSF operate more efficiently. However, laying off over three dozen faculty members, enduring a 9% pay cut, on top of a 2.5% previous cut, and losing substantial numbers of students during the turmoil is not the answer. “We want to have a college when this is over,” Messer stated. She thanked everyone who had come out in support and received a standing ovation from the crowd. AFT 1493 was one of five honored before the entire convention on our 50th birthday. 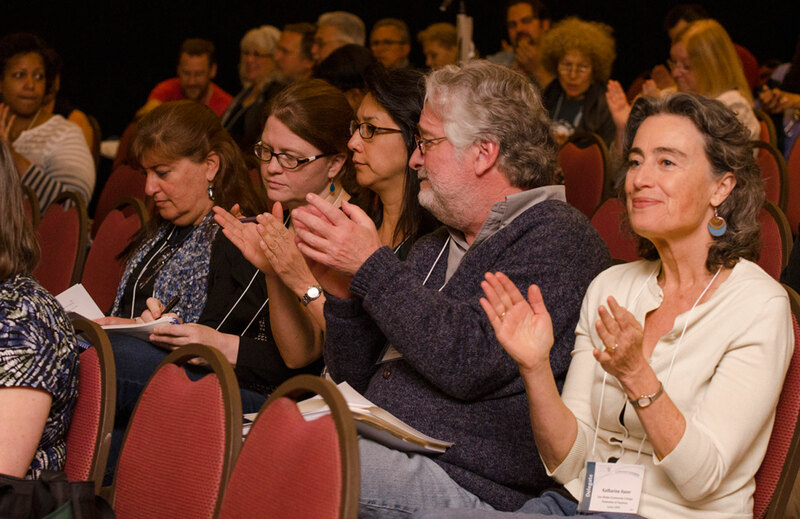 Our local’s delegates: President Teeka James, Co-VPs, Joaquin Rivera & Katharine Harer, Secretary, Monica Malamud, Skyline EC Rep, Nina Floro, and Executive Secretary, Dan Kaplan, were asked to come to the stage for a birthday ovation. It was a proud moment for AFT 1493 as the entire convention cheered us on. At the 2013 CFT Convention, held in Sacramento from March 15-17, AFT Local 1493 won four Communications Awards. In the category of Best Use of Graphics, Eric Brenner won Second Place for his “Under Their Thumb”, which appeared in the February 2012 issue of The Advocate. In the category of Best Email Newsletter for locals with more than 500 unit members, AFT 1493’s The Advocate, edited by Eric Brenner, won Third Place. In the category of Best Single Effort for locals with more than 500 unit members, attorneys Bob Bezemek and David Conway, and Dan Kaplan, AFT 1493 Executive Secretary, won Third Place for their Advocate articles (“AFT Charges District with selective prosecution and suppressing freedom of speech”, May, 2012 and “District calls in D.A. after union staffer forwarded political email message: bizarre 6-month criminal investigation follows”, October, 2012) about a District Attorney investigation. And, finally, in the category of Best Web Site, aft1493.org, Eric Brenner, Webmaster, won Third Place for locals with more than 500 unit members. For the past three years in a row AFT Local 1493’s Web Site has won First Place in this Best Web Site category, so it was almost inevitable that we wouldn’t win the First Place award forever. But winning Third Place in the state this year is still a nice honor! Trustees on the San Mateo Community College District Board are currently elected at large by all the voters in the county, however the California Voting Rights Act allows challenges to at-large elections based on the idea that countywide voting systems can dilute minority votes and prove to be a barrier to ethnic minority candidates. To avoid a possible lawsuit on this issue, the Board has held public hearings in recent months on the matter and a proposal for elections of Trustees from 5 separate districts has been proposed. At the March 21 meeting of the Board of Trustees, the decision was made by a vote of 3-2 to not adopt district election of members of the Board of Trustees for the November 2013 election. The meeting began with Trustee Helen Hausman reading a prepared statement that she was resigning from the Board within a month. When the discussion began later concerning Resolution No.13-5, Resolution Establishing Trustee Areas From Which District Governing Board Members Will be Elected, it was revealed that somehow Pat Miljanich had failed to previously provide her correct home address. Since the last election she has moved from Belmont to Redwood City. This is where Karen Schwarz also lives. So these were two new developments added to the discussion of whether or not to pass the resolution on the March 21 Board agenda to move to district election of the Board of Trustees for the November 2013 election. During the discussion Trustee Schwarz indicated that she was not in favor of moving to district elections. Trustee Hausman said she was still unclear about how this would be done. Trustee Miljanich said again that she was in favor of district elections. But she then indicated that she hadn’t realized when discussing the various maps that drew the boundaries for the districts in various different ways that the boundaries that had finally been agreed upon would create one district that didn’t have an incumbent residing there. This was of real concern to her. In fact, most of the discussion at the March 21 Board meeting was about how the five district boundaries would be drawn, and specifically about if it was possible for the Board to create districts that didn’t include two of the incumbents living in the same district. And as the discussion made clear, this can’t be done without making the boundaries odd and inappropriate, and obviously politically motivated. The law allows for this to be a consideration, but it can’t be the primary motivation regarding how districts are drawn. There was then expressed by several Trustees an interest in waiting until the 2015 election cycle to make a decision about moving to district elections. But the lawyer the Board hired for advice said that if this was done, then the Board was taking a risk that they could be sued for violating the California Voting Rights Act of 2001. In the end, Trustees Holober and Mandelkern voted in favor of implementing district elections in November 2013, and Trustees Hausman, Miljanich, and Schwarz voted No. The student Trustee (whose vote is only advisory) voted Yes. At the end of the April 10 meeting of the Board, Trustee Miljanich requested that another discussion of district election of Trustees be placed on the agenda for the meeting of April 24. This agenda item was entitled: Evaluation of Results of First Review of District Elections and Consideration of Next Steps. At the end of the April 24 Board meeting, Trustee Miljanich proposed a resolution to reconfigure the Board sub-committee that was created to lead the transition to district election of members of the Board of Trustees. This sub-committee previously consisted of Trustees Richard Holober and Dave Mandelkern. Miljanich suggested that the new Board sub-committee should consist of herself and Trustee Schwarz. Trustee Miljanich said that she wanted to examine district elections more closely, and she felt that she could achieve a deeper understanding if she were on the sub-committee. In particular, Trustee Miljanich said she wants a better understanding of the concept of “communities of interest” that the California Voting Rights Act of 2001 makes reference to. She also felt that she could ask questions more closely if she were on the sub-committee. Miljanich wants to bring the subject of the drawing of the district maps back for more discussion. Miljanich concluded her remarks by saying that the Board was still engaged in the process of discussing district election of Trustees, and to that end she asked for a vote in favor of forming a new Board sub-committee to further explore this issue. The Board vote on her proposal was 3-1 in favor of forming a new sub-committee consisting of Trustees Miljanich and Schwarz. Trustee Mandelkern voted No, Trustee Holober abstained, and Trustees Miljanich, Schwarz, and Hausman voted Yes. This was apparently the last meeting that Trustee Hausman will be attending, ending her long career on the Board of Trustees, as she announced during the meeting that she will be sending in her letter of resignation from the Board on May 1. An analysis of AFT 1493’s faculty workload survey is still progressing. The data is clear that faculty are overwhelmed and the three colleges have very different cultures and practices with respect to evaluations, program review, hiring, and so on. A full report will be published in the first issue of the Fall Advocate. It isn’t the “load” of work that bothers me: it’s the futility of much of the work. Program review, accreditation, SLO assessment: all of these are forms of educational research or administration that should be done by educational researchers or administrators–people with training, time, and compensation to do the enormous amount of work required if these things are to be done well. Instead, we give these tasks to faculty who aren’t likely to have any training or time, and little compensation. As a result, these things are done poorly: we get Learning Outcomes that tell us very little of learning, and a lot of paperwork that seems wasted. I have no problem with accountability and measuring results. But SLOs, Peer Review, Program Review, Advisory Committees (for CTE) and similar requirements are consuming a huge amount of time with no discernible benefits. If you want accountability and measured results let’s find a better method that takes less time and really works. We are being asked to do more for the same pay and no release time. Our students are suffering instead of benefiting from all the SLO push. I no longer have the time to explore new teaching methods in an effort to improve the educational experience for my students. Deans and upper administrators appear to be unaware and not particularly concerned about faculty workload issues. Thus, they come up with more and more “initiatives” that we are compelled to do for the “good of the college” or under the threat of the accreditation looming over us. This not-so-subtle pressure on faculty has a negative effect on morale. We know what is important for good teaching but we are often forced to take part in work that is a waste of time (SLOs, for example). As a result, we are too exhausted to take part in activities that would actually benefit teachers and students and build morale and community. The amount of forms and general paperwork is noticeably increasing in the last few years and really is taking away from time that could be devoted to prep and teaching. It also seems to be sucking the joy out of teaching. Campus climate is deteriorating rapidly because of SLO workload. I haven’t seen things this bad in the 30 plus years I’ve been here. Updating the San Mateo community on the sale of the non-commercial TV station KCSM-TV, which has been housed at the College of San Mateo since 1964, is no easy task. For the second consecutive time, a public records request filed by Media Alliance (MA), this time accompanied by a request by the Palo Alto Daily Post newspaper, has been denied by the Board of Trustees. In 2012, the names of the bidders were not released until the District had already decided to reject all 6 bids. In 2013, the District confirms that negotiations are on-going with one “top bidder”, but refuses to divulge who that top bidder may be and what their plans are. District staff member Jan Roecks responded that it was not in the District’s “interests” to release information regarding the status of the RFP and on-going negotiations and would not set a firm date when any information would be available. Media Alliance fears nothing will be forthcoming until the end of the process when bidders have already been turned away and the outcome is a “fait accompli.” Such non-transparency excludes the campus community, the station’s members and San Mateo residents, and is not appropriate for a public asset that serves 60 cable systems and half a million people in 10 different Bay Area counties. The community college district didn’t pay a cent to acquire one of the largest public television stations in the state of California. Like all non-commercial broadcast licenses, KCSM-TV was gifted to serve the information and cultural needs of the surrounding community. Gifted for free. The only costs are operating costs and the District receives Corporation for Public Broadcasting grants and whatever underwriting income can be generated. The College of San Mateo once attracted students from all over the state who enrolled in the best broadcasting training offered by any 2-year college in California. Recent statements that SMCCD wants to make a bunch of money by dissolving the station and selling to a for-profit wireless company, Locus Point Networks, rather than engaging in negotiations with other bidders, who include Free Speech TV co-founder John Schwartz and several other community groups, could be considered naked profiteering off public assets with little concern for the purpose of the license or the stakeholders in the community. In an era of dramatic media consolidation and wholesale corporate control of commercial media, the few independent outlets left are valuable and should not be eradicated lightly. While the Internet provides many sources of news and information, lack of net neutrality, privacy issues and growing cybersurveillance demonstrate the Internet may not be a bastion of free speech indefinitely. If the mission of the San Mateo Community College District is education, then the current seeming intent of the Trustees is an abandonment of mission in pursuit of a pot of gold at the end of the rainbow. The next Board of Trustees meeting is May 15th at 6:00 pm. Please come to say that if the District doesn’t want to operate a TV station anymore, then it should transfer the license to another nonprofit that will not auction KCSM off like a junked car for scrap metal. Sunlight is the best disinfectant. MA believes the district is not being forthcoming about the current set of negotiations because this is not what students, faculty and San Mateo residents want. State Senator Leland Yee and Senator Anna Eshoo have already written to the Trustees saying that they want the license sold to a qualified nonprofit who will continue to operate a public TV station. If you want to say the same, write to trustees@smccd.edu or come to the Board meeting on May 15th at 6 pm. Tracy Rosenberg is the executive director at Media Alliance, an Oakland-based democratic communications advocate. They can be found on the web at www.media-alliance.org. Please note, the invitation is for both retired faculty and current faculty, and of course their partners and friends. It is hoped an event like this will provide some sparkle in your life!! Certainly it comes at a bargain price! The first two recipients of the newly established AFT Local 1493 scholarships have just been determined by the AFT selection committee, which consisted of Teeka James, AFT President, Lezlee Ware, Cañada Chapter Co-Chair, and Dan Kaplan, AFT 1493 Executive Secretary. The winners of the AFT 1493 2013 scholarships are Rashin Parsa and Natchapat Chan, both students at Skyline College. Rashin and Natchapat will both receive $1000 from AFT Local 1493. The AFT will be awarding two $1000 scholarships annually, starting a new union tradition in the San Mateo Community College District. 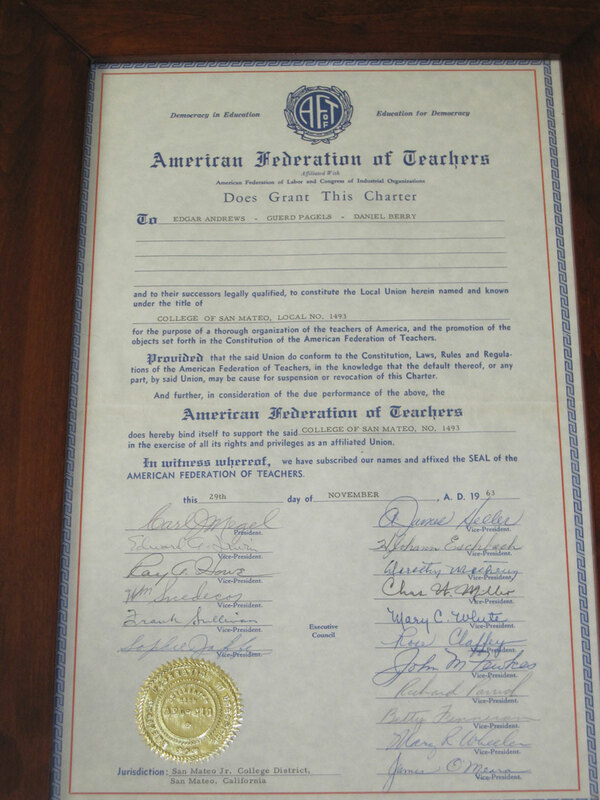 American Federation of Teachers Local 1493 was granted its charter by the national AFT on November 29, 1963. That means that the San Mateo Community College Federation of Teachers will be turning 50 years old during the Fall 2013 semester! To that end, AFT 1493 wants to announce well in advance that we are planning a gala celebration of our birthday this coming Fall, and we want you to make plans to attend. All of the details of our party will be announced at the start of next semester. At the March 2013 CFT Convention several Locals, including ours, were honored on the anniversary of their founding. But not all of these Locals had reached the ripe old age of 50!